HOT! This rare 1999 Wizard of Oz miniature ornament is 1st in the Wonders of Oz series. Mint in mint box, never used. HOT! I have all the Hallmark Wizard of Oz ornaments available. Please email if you are looking for any others in particular. Mint in mint box, never used. 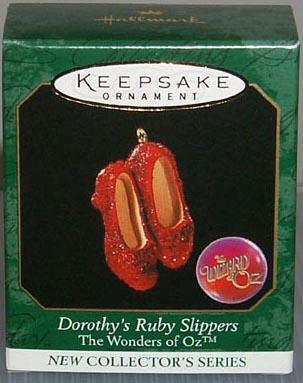 Items Similar To "Dorothy's Ruby Slippers Hallmark Miniature OZ Ornament"